The author loves to throw big buck tails like this Bait Rigs model shown here. Most of the information focusing on pike fishing zeros in on the post-spawn period when pike are in shallow weedy bays, readily spotted and aggressively feeding. 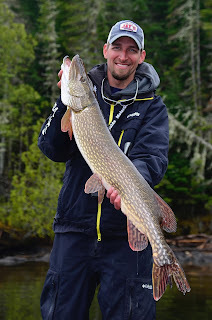 Spoken as a person who has caught hundreds of trophy sized pike in shallow water, I can say the experience of sight fishing for these monsters is amazing. The problem is, this bite is short lived. Ice out plays a major role in the post-spawn pike bite and there is literally no way to predict when ice out is going to occur from year to year. The only way to deal with this issue is to remain flexible in your fishing schedule and hit the water when the conditions are ideal. Not everyone has the luxury of being able to set aside days or weeks of time to hit the post-spawn bite nuts on. 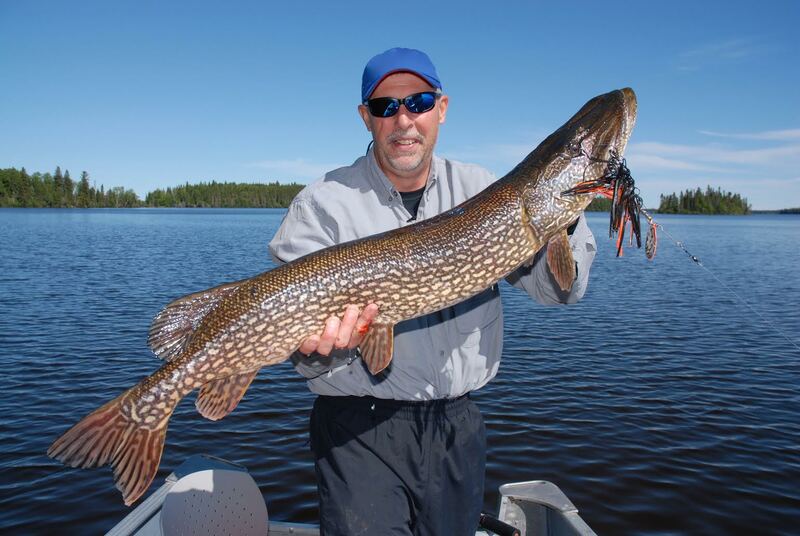 The good news is there is another lesser known big pike bite that occurs in late summer and trickles into the fall. In late summer pike begin to invade the shallows again, but the weed choked back bays aren’t where the action happens. In late summer pike pull into the deep water weed edges typically found in six to 15 feet of water. Cabbage weed or what is formerly known as common pond weed is the aquatic growth that attracts the most pike. These weeds grow in deep water and often form into well defined edges where shallow and deep water meet. For pike fishing the more defined the weed edge is and the more closely associated the weeds are to deep water, the better. This environment provides pike the cover they need to find prey species like suckers, walleye or perch and also a place to sulk away after they have fed. What’s common for adult pike is for these fish to slip into shallow water to feed, then these same fish drop out to deeper and cooler water to digest their meal. This transition allows pike the luxury of finding forage when they need it and the metabolism benefits of digesting their food slowly in cooler water. the more pike like them. As the summer starts to wain into fall, water temperatures in the shallows drop and become more similar to the deeper portions of the main lake. This temperature transition allows pike to spend more time in shallow water without giving up the metabolism benefits of digesting their food in cooler water. This is precisely why the weed fishing gets better and better as the water cools in early fall. Fishing in weed cover is always challenging. Most baits with open hooks simply can’t be fished in the salad without constantly dealing with fouled lures. I depend on three baits for targeting pike in weed cover including the Johnson Silver Minnow which is a weedless spoon, musky-sized bucktails and also oversized spinnerbaits. The Johnson Silver Minnow is a classic and has been producing pike for generations. I usually throw the largest size in either the genuine silver or gold plated versions. These baits are also available in the classic five of diamonds and red/white patterns that so many pike anglers covet. These spoons cry out for a soft plastic or pork rind trailer. The trailer gives these spoons more action, a slower drop rate and a scent trail in the water. The problem is it doesn’t take much of a trailer to destroy the delicate rocking action these spoons posses. My “go to” trailer is a three inch white PowerBait twister tail threaded onto the hook. An Uncle Josh pork rind split tail is my second choice. Trailers any larger than these described will deaden the action of the Silver Minnow. Bigger bucktails are also a great bait for weed fishing. Musky sized bucktails are by far my favorite pics for trophy pike fishing and there are lots of great bucktails out there to choose from. Among my favorites is the Bait Rigs Viper 2 Mag 5 Pikie Bucktail. These double bladed bucktails give off a ton of flash and vibration, yet they are not so big that throwing one for hours becomes an issue. Anyone who has casted and retrieved a big bucktail for hours on end will support me when I say this type of fishing can be brutal on your forearm and wrist. The Mag 5 is the perfect compromise of flash and vibration without being a pain (literally) to retrieve. The third bait I always have on hand for fishing pike in the weeds are oversized spinnerbaits. A spinnerbait will fish through amazingly dense weed cover without hanging up. Again, the baits designed for musky fishing are built tough enough to handle trophy sized pike. If you fish with spinnerbaits designed for bass fishing, a hooked pike will bend the wire these lures are made of into knots. pike fishing on the planet. I like willow leaf blades on spinnerbaits because they can be fished fast over the top of weed growth or they can be fished slow and allowed to dredge up pike from deeper water. The resistance these baits create in the water is also modest making it possible to cast spinnerbaits all day long if necessary. A trailer hook is an absolute must when fishing pike with spinnerbaits. Without this small but important accessory, half the strikes from pike will result in missed fish! The weed bite kicks in during August and gets nothing but better in September and October as the waters slowly cool. Eventually all good things must come to an end and when the water temperature in the shallows dips below 40 degrees, the weed bite is done for another year. 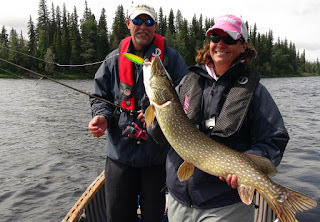 Compared to the shallow water post-spawn bite, pike can be found in or near the deep weeds for months instead of days. Now that is a bit of fishing information that any pike fishermen should welcome.